The waters are right up there with the Great Barrier Reef. The waters are right up there with the Great Barrier Reef. Truly a paradise and the most beautiful water I&apos;ve seen. Majestic and worth every second you spend on the island. The stingrays have their barbs so they can sting you, but they should be basically trained by now. The stingrays have their barbs so they can sting you, but they should be basically trained by now. They are adorable and slimy. I loved this one. We did Reef and Rays snorkeling. We did Reef and Rays snorkeling. We had an excellent time. Cool reef, lots of fish and were able to interact with rays as well. We did this in April as well! We did this in April as well! Incredible and you will get your full monies worth! Staff is awesome friendly and helpful. The rum punch was on point! The beaches are amazing! Do it!!! 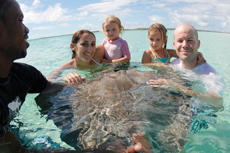 Plenty of sting rays and the crew held large ones for us to touch and kiss. Plenty of sting rays and the crew held large ones for us to touch and kiss. Very funny guys and lots of fun. Nice day out but overpriced for what it was. Nice day out but overpriced for what it was. I think the cruise lines are quashing competition to up the price. Snorkeled first, then went over to island very near Grand Turk for the sting ray swim. We did snorkeling and sting ray! We did snorkeling and sting ray! Definitely recommend, this was our favorite excursion. The snorkeling was amazing! Went to Gibbs Key, it was amazing to see the wild stingrays come right up to the shore! First we stopped for a 30 minute snorkel session. Great experience. Trained staff kept everyone safe. This was the best excursion of our cruise. The stingray swim was fun and everyone from the children to the grandparents had fun. Like Nassau, this was not our first visit to Grand Turk. Snorkeled a reef where there were plenty of species of fish to be see. This a fun snorkel, stingray, and beach trip. This a fun snorkel, stingray, and beach trip. The crew was great and very friendly.